gotu kola, COQ10, cocoa and shea butters, therapeutic essential oils, botanicals, and more! 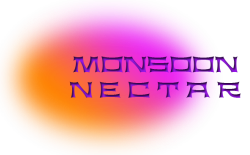 Monsoon Nectar Chakra Aroma Body Care products. ​is natural and organic and part of a healthy Green lifestyle. instant and cumulative results for more youthful eyes. unique roll-on serum around your eyes, face, neck, chest. ​For men and women. For all skin types. FREE Beauty Bar Neutral Cleanser sample with every order. Get In Touch With Your Skin: Target the largest organ of your immune system, your skin * Support healthy immune function with antibacterial / anti-fungal properties * Loaded with vitamins, nutrients, and aromatherapy * Monsoon Nectar is Non Toxic Skin Care * A shield of protection for better hygiene, health, and well-being * Inspiring, grounding and supportive. Biodegradable, Water Free, Cruelty Free: Hand made in small batch, 100% natural and organic Essential Oil + Botanical formulas manufactured in the Southwest. Monsoon Nectar uses minimal, low impact and recyclable packaging, containers, and shipping materials. ​. NO Synthetic Fragrance, Silicone, Phthalates, Sulfates, Parabens Hypoallergenic. People come from all over the world to tap into the healing energy of Sedona, Arizona. Not only one of the most beautiful places in the world, Sedona is rich in geological intensity that has the potential to magnify our innate power of intuition, psychic capabilities, and cosmic connection~ meaning higher consciousness. People come to Sedona to give their life new meaning through intentional thought, speech, and right path and are supported by a community of like-mindedness that perpetuates this Love! The Spiritual Side of Sedona beckons us to experience our lives through a cosmic perspective. You are invited, so please come! Stay in touch for exclusive offers, new product arrivals, and yoga events!